Bidding a project is time consuming and stressful. Clients frequently use 6-10 bidders on each project. This is often due to company policy. “Behind-the-scenes” politics may come into play when a company calls for bids knowing that a firm has been preselected. Contractors cannot control these factors. The choice to present the best possible bid is always good business and a choice towards success. Selecting the lowest price is a tempting way in which to choose a contractor for a project. Far too often, it is the determining factor. While price is an important consideration, the bidding process has other pertinent variables. “Spec to Spec” bids are an inefficient and ineffective way to determine the best contractor for a project. Since each manufacturer builds unique qualities into their systems, the idea of matching specifications between bids is seriously eroded. If all of the systems produced were identical, there would be no competition and no incentive for companies to update technology, refine materials or meet the requirements of each specific job. Manufacturers usually include peripheral items that are either job or company driven. For example, one manufacturer may include smoke detectors or curbs that another company may not have available to offer. Items may inadvertently be left out or duplicated. These things may unwittingly disqualify a bid. Pool dehumidification specifications are sometimes written as much as a year in advance. When they are needed and sent out, equipment may have become unavailable and/or obsolete. The data provided on these specifications is necessarily limited. Without complete information, dehumidification specialists do not have the relevant information to prepare accurate proposals. 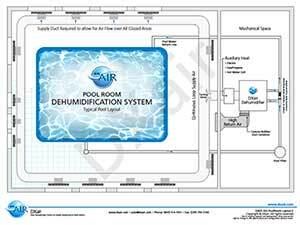 A solid, qualified bid should include the four main features of indoor pool room dehumidification and environmental control: dehumidification, heating of the space, cooling of the space, and heat recovery. Each job has unique characteristics and each bid should reflect those design considerations of usage, water/air temperatures, relative humidity (RH) to be maintained, heating method, cooling, and sensible calculations for the space. Pool dehumidifier size is not measured to an industry standard. Many do not fulfill the ASHRAE guidelines for air turnover rates, outside air, activity factors, and pool room evaporation rate. The equipment schedule provided to contractors by manufacturers may be limited by what equipment is provided on the equipment schedule. Be aware of the possibility of undersized equipment for the application. In order to keep equipment size minimized and to show that evaporation rate is maintained, a manufacturer may spec a system for RH that is not maintainable. Some companies may size equipment for various water and air temperatures and 60% RH. In most cases, temperature and humidity are maintained at different levels than this due to outside factors. A bid that considers the most efficient energy consumption is a worthy contender. Electric duct heaters may be choice in some geographic areas for heating indoor pools during the winter season and may be prohibitive in cost for other regions. Manufacturers aim to keep the cost of the system low with a standard quote using electric heaters. A quality contractor will review this with an eye toward matching the best energy plan for the job. Careful review of manufacturer specifications may reveal wording to ensure that others cannot bid against the equipment specified. This may take the form of placing qualifications on contractor eligibility. Statements that require HVAC contractors to have been in business for a certain number of years in order to bid the project are unjustified. Should a contractor who is starting an independent company after working for many years in the field be disqualified by such an arbitrary requirement? Spec to Spec bidding generally does not address the actual needs of a job and the abilities that a contractor has to offer. The objective is not to be the lowest bid, but to provide the system and installation that offers the client the highest degree of functionality and quality.